While Valentine’s Day is all about love and romance, for younger kids it’s about candy and Valentine’s cards. 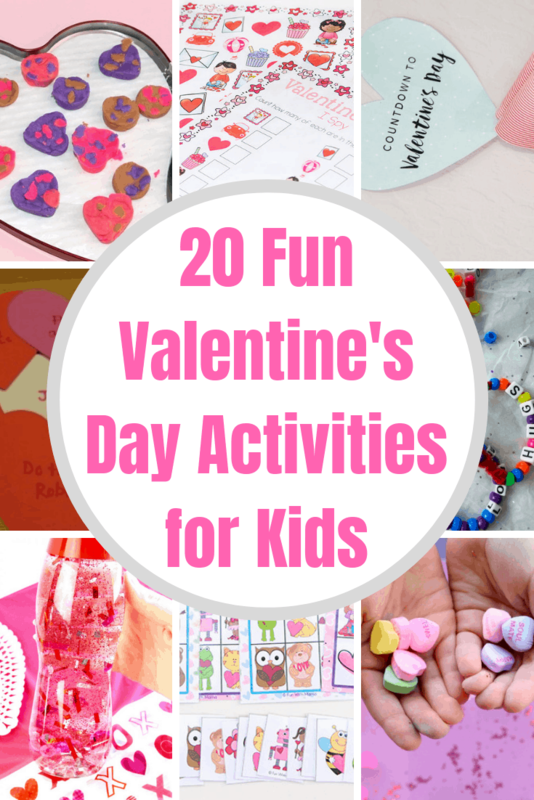 Whether you are looking for a fun activity for your kids to do at home on Valentine’s Day, or even in your homeschool classroom, these activities are sure to please! No matter what age your child is, I guarantee there is something on this list that they are going to love! All of these activities are so easy to do and set up, and your kids will have a blast doing them! Here are 20 fun Valentine’s Day activities for kids. Candy Heart Water Play – What child doesn’t love playing with water? What a great way to get in some V-Day themed winter water play! Valentine’s Sensory Painting– Sensory activities are always some of my favorites during winter. The conjunction of imaginative play and somewhat active play helps cure that feeling of inactivity that winter brings. Valentine’s Bracelet– This easy bracelet craft is perfect for Valentine’s Day gifting! Musical Hearts Game– I love this activity! It’s like a cross between a cake walk and musical chairs, with fun activities when the music stops rather than winning cakes. Kid’s Valentine’s Day Wreath– This easy, yet adorable craft is another great Valentine’s Day activity. Valentine’s Bingo– These printable Valentine’s bingo game boards are adorable and will allow even non-readers to play. Valentine’s Water Globe -This fun V-Day water globe is both a great activity in it’s creation, and also good for continuing to occupy children as they shake and watch the globe settle. Countdown to Valentine’s Day – Another great for all ages activity is this fun Valentine’s Day countdown paperchain (with a free printable). Valentine’s Day Slime – Whatever the holiday, kids want to make slime! This Valentine’s Day slime is the perfect choice. Collage Art Activity – This is another activity that will work for many age groups! Valentine’s Sensory Bottles – Kids and adults love sensory bottles! Make several of these for Valentine’s Day with your kids. Decorate Valentine’s Cookies – This twist on making V-Day cookies is fun and educational! Valentine’s Day Love Craft – Washi tape + paint. What more needs to be said? Heart Suncatcher – This easy craft will look great displayed on your windows to decorate for Valentine’s Day! Valentine Memory Game – Memory games have always been a hit with my kids. This printable makes a great Valentine’s themed game. Valentine Ice Hearts – This ice and shaving cream activity is sure to make your kids happy! Playdough Chocolates – Use playdough to recreate the look of a box of chocolates. Which Valentine’s Day activity will you do first?